​The Erne System has its share of dramatic landscapes and historical treasures; the monastic round tower at Devenish Island rising up from the Lough, the ruined remains of Tully Castle, the picture postcard image of Enniskillen’s medieval castle on the edge of its island banks and the National Trust’s Castle Coole and Crom Estate all compete for your attention. ​Built amid the 18th-century canal fever that swept across Ireland, the 144km Grand Canal stretches across the country from Dublin to the Shannon. 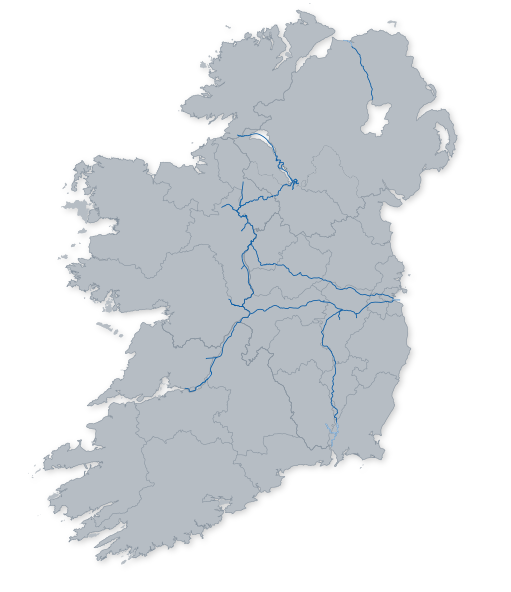 The Royal Canal, on its 146km journey from the River Liffey in Dublin to the Shannon, passes 46 working locks, 10 of them double-chambered. Running between Leitrim Village and just north of Belturbet, the Shannon-Erne Waterway links the two great waterways on the island, the Erne System and the Shannon Navigation. ​The Shannon is a treasure waiting to be discovered. The longest river in Ireland, the River Shannon and its lakes are a bustling, colourful navigation.